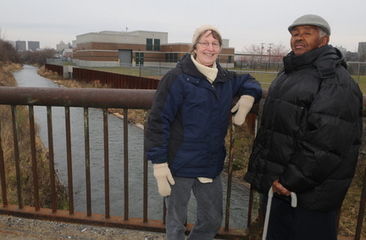 Sewage treatment plant forced eviction of 35 African American families and polluted water and soil. But Ejos managed to close it and initiated a new political path towards more equitable policies and urban plans. A small community in the Southside Neighborhood of Syracuse in Onondaga County was the target for a large sewage treatment plant that resulted in the forced eviction of more than 35 African American families, the stigma of having such a facility in their neighborhood and the threat of further environmental burdens. In 1988, the Atlantic States Legal Foundation (ASLF) along with the New York State Department of Environmental Conservation (NYSDEC) sued Onondaga County under the Clean Water Act for its discharges from the county’s METROpolitan wastewater treatment plant and from 63 Combined Sewer Overflows (CSOs) from county trunk sewers . Combined sewer systems collect stormwater runoff, domestic sewage and industrial wastewater into one system where it is treated before being discharged into the environment. During wet weather, these systems can be overwhelmed by the volume of stormwater and can overflow into predesignated locations, called CSOs. Regulated by the 1972 Federal Clean Water Act, CSOs release raw sewage into the environment, posing both environmental and public health risks . These discharges were greatly polluting Onondaga Lake and its tributaries. The County was required to develop a plan to bring the discharges from Metro and the CSOs into compliance with water quality standards. After ten years of discussions, a plan to establish five regional treatment facilities in neighborhoods along Syracuse’s creeks was agreed upon in 1999 . This Amended Consent Judgment (AJC) called for the projects to be completed by 2012. One project was the Midland Avenue Regional Treatment Facility and would use a chlorine-based technology with above ground storage . In 1999, Onondaga County announced its plan for the facility that called for the eviction of 35 low-income African American residents at the proposed site . Concerned residents started organizing and formed the Partnership for Onondaga Creek (POC) advocating for more equitable and safer CSO abatement projects, specifically the use of green infrastructure to promote stormwater infiltration combined with storage infrastructure . 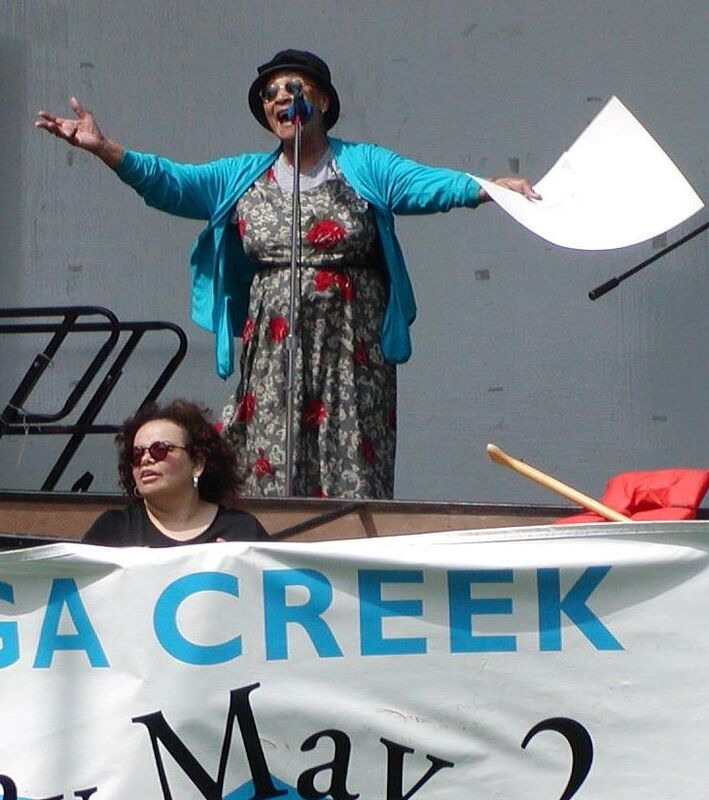 Supported by numerous environmental advocacy groups, social justice activists, students, scientists, clergy, teachers, business people, the Onondaga Nation, universities, and national environmental organizations, the POC educated itself and fought for 3 years with no success getting the county and NYSDEC to budge on the plant’s site or its chlorine-based CSO technology. In April 2004, POC filed a Title VI of the 1966 Civil Rights Act administrative complaint to the USEPA against Onondaga County and the NYSDEC claiming discrimination . This community has suffered from past environmental injustices including urban renewal projects that sliced the city by an interstate highway, repeated evictions for municipal projects and the building of an industrial park alongside their community. They also battled the County over its garbage-burning steam plant proposal in the ‘70s and 80s . Onondaga County’s plan was just one more act of discrimination for this nearly 84% African American community . While POC lost this battle, their fight was not hindered. During the summer of 2004, POC members participated in acts of civil disobedience, occupying office spaces and demolition sites, resulting in their arrest . Back in 2000, activist Aggie Lane demonstrated outside the home of a county Executive to protest plans for the Midland Avenue sewage treatment plant . Despite the hard and persistent work of POC and its many supporters, Onondaga County continue with its plans for the Midland plant which was constructed in 2005 . Good news came in 2007 when Joanne Mahoney was elected Onondaga County Executive. Not in favor of regional treatment facilities (RTFs) such as the Midland Avenue facility, she worked closely with members of POC, the Onondaga Nation and ASLF to generate an alternative plan to the one originally developed in 1998 that called for five RTFs. The new plan scrapped the three remaining RTFs and the huge pipeline initially slated to lead to the Midland facility in favor of underground storage and green infrastructure. This was approved on November 4, 2009 . So while there was most definitely a lot of bad that came from this project (forced evictions, stigma of a sewage treatment facility in their neighborhood, and the threat of worsened air and water quality), there was one major victory that came out of this ten year struggle and it resulted from the persistence and dedication of POC and its allies. Other High asthma rates in this community because of local industry. Air pollution would increase as a result of the construction of the chlorine-based treatment facility: volatized chloroform and other trihalomethanes (THMs) formed by the chlorination of the plant’s effluent will adversely affect the neighborhood’s air quality. Toxic chlorinated by-products are harmful to both humans and aquatic life. Other High sewer tax: the plant will cost taxpayers at least $122 million. Syracuse’s low-income homeowners will be economically stressed by this regressive sewer tax. Residents were promised jobs at the Midland construction site as a community benefit but only 5 people of color out of 158 workers were given jobs. Development of Alternatives Partnership for Onondaga Creek (POC) worked closely with County Executive Joanne Mahoney beginning in 2007 to develop a healthier, environmentally and socially friendlier CSO abatement alternative (underground storage and green infrastructure) was proposed. Green infrastructure included sewer separation, rain gardens and permeable pavement and green roofs at a cost of 10-20% less than construction of previously planned treatment plants. Why? Explain briefly. Although the Midland RTF was built, activists were able to affect the rest of the planned construction and positively impact the environment through green infrastructure and underground storage.